South Korean stocks and currency have been the worst performers in the Northeast Asian category so far this year, underscoring investors’ doubts about the export-reliant economy amid escalating uncertainties on the trade front. 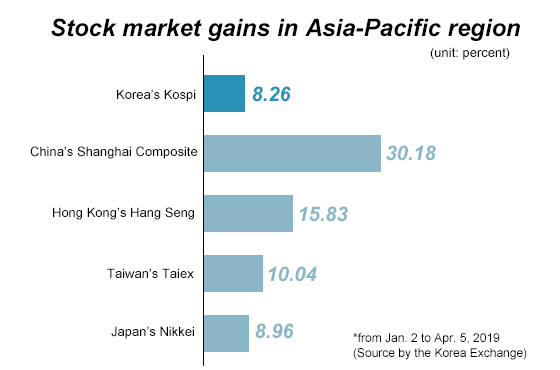 The main Kospi gained 8.3 percent as of Friday since the beginning of the year. During the same period, the Shanghai Composite index soared more than 30 percent, the Hong Kong’s Hang Seng index 15.8 percent, Japan’s Nikkei 9 percent, and Taiwan’s Taiex 10 percent. The MSCI Emerging Market Index rose 12 percent. Faster weakening in the Korean won on top of worsening earnings prospects of the Korean Inc. dampened foreign appetite in Korean stocks. The Korean won no longer mirrors the Chinese yuan like it used to because foreign investors took them in similar light due to the Chinese share in Korean trade. Their correlation ratio that hit 0.93 last year now hovers at 0.09 amid deepening in decoupling. The U.S. dollar fell 2.35 percent from 6.87849 yuan on Jan. 2 to 6.71680 yuan on April 8. During the same period, it gained 2.48 percent from 1,114.6 won to 1,142.2 won. Korea may see a deficit in current-account balance as exports have contracted for four months in a row since December. Another damper for the Korean won is record cash dividend payout promised across March and April to foreign shareholders for the 2018 fiscal year, said Meritz Securities. Shinhan Financial Group, Posco, SK Innovation, SK Telecom are expected to pay more than 200 billion won ($175 million) to foreign shareholders this month in cash dividends. Tech giant Samsung Electronics will also pay out 1.44 trillion won, SK Hynix 528.2 billion won, Hyundai Mobis 438.2 billion won, and KB Securities 550.8 billion won within a month following their shareholders’ meetings in March, said Samsung Futures.